Weddings: Welcome to the most important day of your life. Whether you’ve dreamed up a small, intimate ceremony or a larger, louder celebration, Allegra’s events team is ready to take-on your wish list and make it into a reality. At Allegra Banquets, we can assist you with everything you need to make your wedding day perfect. From choosing your food to selecting the perfect ambience, your personal wedding coordinator will be there every step of the way to ensure that no detail is missed. Additionally, we are happy to connect you with partners within the community: florists, photographers and musicians, who can all help to make your event exceed your expectations. 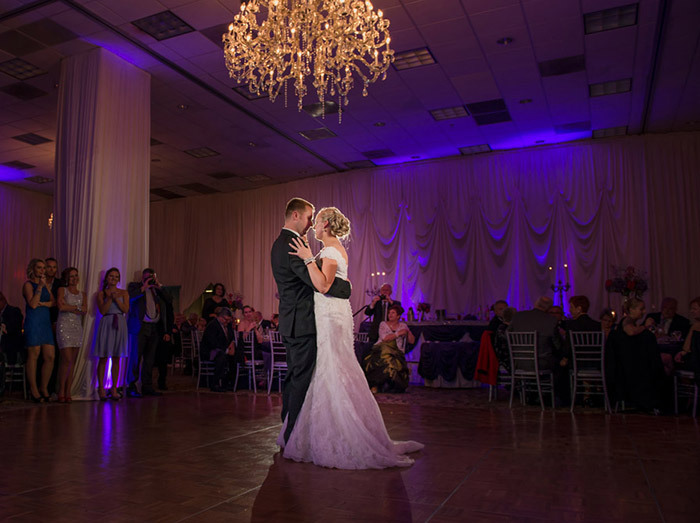 As a new addition to our offerings, our brand new Grand Ballroom, complete with plush carpeting and gorgeous, sparkling chandeliers, is now ready at our Villa Park location. (250 guest max) We have office hours 7 days a week and would be happy to schedule a showing that fits into your schedule. Our wedding package encompasses all of the important details to make your day unforgettable. • Five Hours of Premium Open Bar: Domestic beer, wine, cream drinks and after-dinner drinks. • Our White-Glove Service: One hour of cocktails & butler-passed hot appetizers. • Five Course Dinner: Featuring soup, salad, your choice of entrée with a vegetable and starch. Dessert, rolls and butter, coffee and tea are included. • Linens: White table linens and your choice of colored napkins.